Does Obama have a Hollywood problem? As we head into the 2012 election, one of the questions many in the industry are asking is whether the President has lost his Hollywood support. As Kareen Wynter reports in this video, stars like Matt Damon and Melissa Etheridge haven't been kind with their observations of President Obama's term in office. 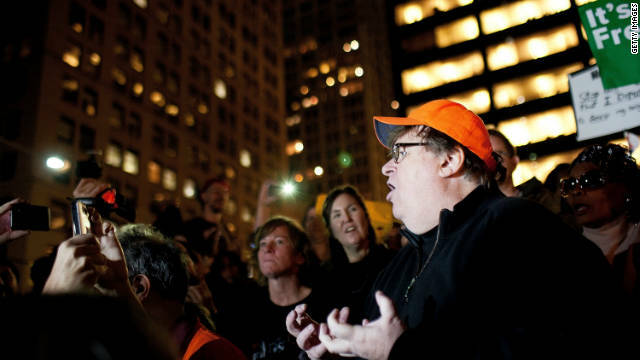 Now we can add filmmaker Michael Moore to that list. The outspoken director conducted an interview with the BBC on Monday in which he describes Obama's first term as "heartbreaking" and "disappointing." "[Obama] did not come into office like I had hoped that he would, to do like Franklin Roosevelt did in his first few months, where he came in and said, 'I'm in charge, this is the way we're doing things, if you don't like it, throw me out of office. And then he set about doing what he had to do,'" Moore said. "Barack Obama came in and said, 'What can I do to help you?' Every time he attempted to help the Republicans, they just shut the door in his face. He inherited a horrible situation, but he spent three years running the ball in the wrong direction." Now that we're in the "last quarter" of his first term, Moore continued, Obama's "actually come alive. He's actually now standing up, and his justice department is going after some of the banks, he's trying to stop a big corporate merger, and he's putting forth jobs bills that make sense now. I don't know why he waited until the last year of his four years to do that, but it is somewhat heartening that he's come around." "Somewhat" seems to be the key word, because Moore wasn't done yet. As to whether Obama's approach in the White House was one of naivete or timidity, Moore posits that Obama is operating on a different set of beliefs than the public was persuaded to think he held. "Goldman Sachs was his No. 1 contributor, and the first thing [Obama] did was appoint these two guys, Larry Summers and Tim Geithner, to run our economic policy, and these were two guys who were completely in the pocket of Wall Street," Moore claims. "Wall Street set the tone and set the policy. So he might actually just believe that. That may just be the sad, sad part about Barack Obama, not that he's too timid or that he's too compromising, but he actually believes in a lot of what they believe in. I hate to say that." In the meantime, Antonio Banderas and Eva Longoria appear to still be in Obama's corner. Also on Monday, those two actors co-hosted an event for the President intended to drum up Latino support. Banderas told CNN that day ahead of the event at the premiere of his film "Puss in Boots" that it's not about the famous faces - "It's about Obama." He continued that the fundraiser was "going to send a message to the Spanish community," and that Obama was scheduled to talk for half an hour. The president is the only black man I would date! Nothing racial, just prefer white men, but I will make an exception for handsome Obama. he needs to get packaged out...fast. "I've learned an immense amount from Dr. Brzezinski." @Joe G., spot on! This guy never cared for any of us past our vote. Hollywood, stop acting like your middle class, go drive the prius to the Learjet to go get your hair done! Come around? HA HA HA HA HA HA HA HA, he is out the door and not soon enough. Obama's biggest "Hollywood" problem are the Jewish people's he's "annoyed" because of his support for the Palestinian cause. They are some of the Democrat's biggest supporters when it comes to campaign contributions. Obama spent $600M on his first election. It's likely he'll need $800M to try to win this time, and who is he going to go to? My doodie is niiiiiiiice and smelly tonight ! I think you might like it. Enjoy the fine delicate aroma of my toots as I do number two. AAAAAAHHHH the fragrance is exhilerating ! DOOODOOOO. Its not just for breakfast anymore. The only reason he is starting to come around is because he wants a second term. America is a Consumer Nation living off barrowed money from China. And he is fiddling on a bus tour to peddle a job bill?! He may not be out of touch with most of the Fantasy Land Celebrities, but where is the paycheck for the rest of us? And if he's so good, where are all those 3 legged stools we paid trillions for. What Democrat would EVER have a problem with Hollywood? obama doesn't seem to understand we all have a problem with him!...we have millions out of work for 3 year now and millions are going in the new year...get the steppin!!!!!!!!!!!!!!!!!!!!!! Who cares? These actors are making money more than him, but Obama has the power to change that. For you to say that celebrities actually mean something to society is total BS. Please report on something that matters. He's sucking their dikks for cash. That's all their good for. You are some rude and nasty people, and all of you need to get a real life for yourselves.